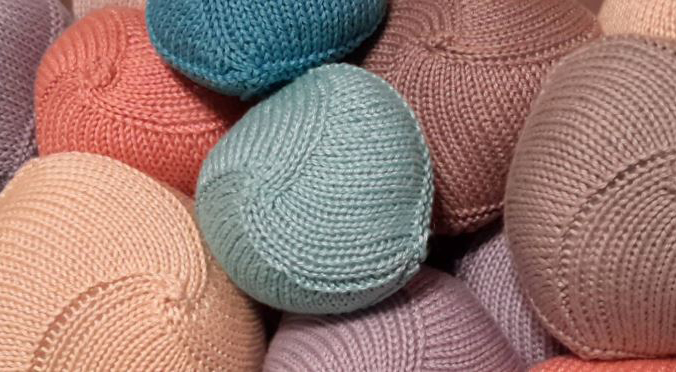 That’s how Demorest discovered Knitted Knockers – soft, handmade alternatives to traditional prostheses that take the shape and feel of a real breast. Her doctor then showed her how to find the pattern, which she passed along to a friend who created Demorest’s first Knitted Knocker. Once she experienced the joy of feeling whole once again, Demorest had found her new purpose: To make these Knockers available to any woman that needs them. To do this, Demorest first wanted to obtain approval from the woman who originally named Knitted Knockers. In an interview with CURE, Demorest explained that a young woman from Maine, who owned a yarn shop first, made a prosthesis for herself after she was diagnosed with breast cancer. With this young woman’s blessing, Demorest and her friends created the Knitted Knockers Support Foundation at knittedknockers.org, and began to spread the word to both the women who could use them and the volunteer knitters that could make them in their area of Washington state. To meet the inevitable demand, Demorest and her team focused on inspiring and equipping knitters and crocheters around the country – and the world – by posting the patterns online (which have been downloaded over 1 million times) and creating video tutorials on how to create them. Non-knitters were also invited to help by spreading the word about the organization or donating. For a woman who needs a Knocker, the process is simple: After choosing a size and quantity online, her order is placed on a state supplier page for a local knitter to fulfill. Finished Knockers are then mailed out – many times within two weeks – with care instructions and sometimes with a personalized note from the knitter. The outpouring of love and gratitude from Knocker recipients has been heartwarming, to say the least. According to Demorest, the rest of 2018 is dedicated to reaching out to the medical community and providing free knitted knockers to even more patients. For more information, visit knittedknockers.org or find Knitted Knockers on Facebook.